What does brain science add to age-old debates about the existence of God and the value of religion? Can political parties and religious groups use scientific insights to influence the beliefs of others? Are scientists as a group becoming more open to ideas of religion and spirituality? Recent advances in neuroscience and brain-imaging technology have offered researchers a look into the physiology of religious experiences. 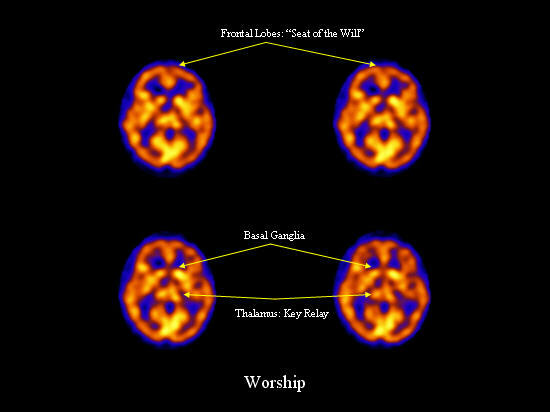 In observing Buddhist monks as they meditate, Franciscan nuns as they pray and Pentecostals as they speak in tongues, Dr. Andrew Newberg, a radiologist at the University of Pennsylvania, has found that measurable brain activity matches up with the religious experiences described by worshippers. The social, political and religious implications of these and other findings are just beginning to permeate the broader culture, according to New York Times columnist David Brooks, who has been tracking new developments in the field. In the following excerpted transcript, ellipses have been omitted to improve readability. Andrew Newberg: How does the brain tell us when we are free? What goes on within us that the brain says to us “Yes, you’re okay, you can do whatever you want to do,” or “No, this is not okay?” How does our brain actually change or transform? This is a critical issue if we’re going to change the views of a voter, if we’re going to change a person’s religion. If one of these things happens to a person, something’s got to be changing in the brain as well. How do we understand what the brain can do? I wrote, with my colleague, a paper on forgiveness and revenge several years ago, about what would be the neuropsychological correlates of that. It becomes very interesting: how we think about ourselves, how we have a construction of ourselves, and how that self relates to other individuals, and how we reconcile when somebody has injured or harmed us. This is part of how I can tie in some of the topics I’ll be covering with some of the topics that have been more broadly discussed here at Key West. There have been some studies that have looked at political perspectives, trying to understand what happens in the brain of people who are Republicans and the brains of people who are Democrats. We talked about some of this, and I’d just highlight a couple of interesting studies. One was an fMRI study, which is a magnetic resonance imaging that looks at blood flow and activity in the brain, and it showed that people who scored higher on liberalism tended to be associated with stronger what they called conflict-related anterior cingulate activity. Now, what that means is, you have a part of your brain called the anterior cingulate, which helps you mediate when things are in conflict with the way you already believe. The researchers then interpreted this, and we can go into all the questions about how should we interpret these studies. People who had greater liberalism seemed to do better or were more sensitive to altering some habitual response pattern, implying that they were more open to change, more open to other ideas, more open to conflict, than people who scored lower on liberalism. Does that mean something about people who consider themselves to be liberals versus conservatives, Republicans versus Democrats? Of course all people, regardless of what their particular perspectives are, when they’re viewing their own candidate, that has a different effect in their brain than when they are viewing a candidate from the opposite party. 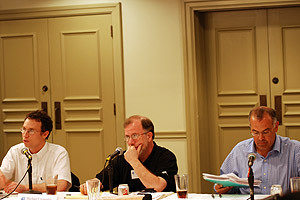 When you’re looking at somebody from the opposite party, or thinking about them, it tends to activate the amygdala, the limbic areas, again, that tend to trigger more of an emotional response, whereas when you’re looking at people who are concordant with your views and beliefs, that tends to activate some of the areas of the frontal lobe and also that anterior cingulate that helps you mediate your conflict-resolution powers. To me, one of the most interesting aspects of this whole area is more philosophical, more theological, and thinking about what does this mean in terms of how we believe in religion, and the religious beliefs that people hold. Does this tell us something about those beliefs and experiences? When somebody has the experience of being in God’s presence, and we can get a brain scan of that, what does that mean, what does that say, and how can we interpret that either for religion, against religion, or in some other alternative perspective of simply just trying to understand it better? Now, beliefs themselves have a tremendous power over us, and I look at this all the time in the context of the placebo effect. Unfortunately, I think the healthcare system severely overlooks how beliefs have power over what happens to somebody. I’m sure probably all of you know somebody who’s dealt with a severe medical problem, maybe cancer or heart disease. We have always noted, at least anecdotally, that when people have that spirit and drive to get better, they seem to have a much higher likelihood of doing that, whereas those who are ready to give up tend not to do that well. That also goes to the importance of how beliefs affect our whole body, not just the brain itself. Of course, we can also look at religious and spiritual beliefs, which is what I will try to focus my talk on throughout the day here. I always try to come at this from a philosophical perspective. Why do we believe anything at all? It is an infinite universe for all intents and purposes. We are able to be subjected to only a very, very small amount of that information [and] an even smaller amount of that information is ultimately put into your consciousness. If you talk to somebody for 45 minutes, they are going to remember maybe three or four things. So our brain is trying to put together a construction of our reality, a perspective on that reality, which we rely on heavily for our survival, for figuring out how to behave and how to act and how to vote. So what are beliefs? Again, I apologize, but I always come at this from a scientific perspective. I am defining beliefs biologically and psychologically as any perception, cognition, emotion, or memory that a person consciously or unconsciously assumes to be true. The reasons I define beliefs in this way are several-fold. One is that we can begin to look at the various components that make up our beliefs. We can talk about our perceptions. We can talk about our cognitive processes. We can talk about how our emotions affect our beliefs. And we can also look at how they ultimately affect us. Are we aware of the beliefs we hold? Or are they unconscious? And which ones are unconscious and which ones are conscious? Several interesting studies have shown that when you show faces of a person of a different race to people, it activates the amygdala, the area that lights up when something of motivational importance happens to us. But if you show pictures of people of a different race that are people they know, and maybe it is a famous person or a friend, then the amygdala doesn’t light up. So they tend to have this ability to culturally, cognitively overcome what might be their initial response. We can look at all these different forces on our beliefs. We can look at our perceptual processes, our cognitive processes, the emotions we have, the social interactions we have, to see how beliefs are so heavily influenced. One of the take-home points I always hope to get across is that as much as we hold onto our own beliefs very strongly — and I think it is appropriate for us to do so — we also have to keep in mind they are far more tenuous than we often like to believe. Let me go through some of these processes in a bit more detail. Let’s talk about our perceptions. The brain is out there trying to take in a huge amount of information and make some coherent picture of the world for us. But, unfortunately, the brain makes lots of mistakes along the way. The most important problem with that is it doesn’t bother to tell us when it does make a mistake. If we are listening to a speech, if we are thinking about an idea, if a friend is telling us something, how well are we really doing at gathering that information out there? How easy is it for us to be manipulated in terms of the beliefs we hold? Now we move over to the cognitive functions of the brain. We talk about the parietal lobe, which is very involved in abstract reasoning and quantization. Parts of the parietal lobe are involved in helping us orient our self in the world and establishing a relationship between our self and the rest of the world. The temporal lobe, which is along the side of the brain; the cortex areas help us to understand language; and the inner parts of the temporal lobe are where our limbic system is — I’ll talk about that in just a second — that helps us with understanding our emotional responses to whatever stimuli are out there in the world. The frontal lobe helps us with our behaviors and executive functions, the functions of deciding what we need to do: what we’re going to do tomorrow, keeping our schedule, keeping our checkbook, and so forth, while also mediating our emotional responses. There is a push-pull between our frontal lobe and limbic system that can get out of whack sometimes. If we get overly emotional, our frontal lobes shut down, and if we become over-logical, our emotional areas shut down. There is a lot of push and pull that goes on in these different parts of the brain. Emotions are also important for placing value on beliefs. So it’s not just that we feel we should do something for the environment, it’s not just that we feel we should be a Republican or a Democrat, but we start to imbue those choices with emotions. We feel strongly about the ways in which we believe, and of course this can help us form beliefs. The downside of our emotions can be in how they help us defend our beliefs. There has been a lot of research looking at when people start to feel combative and antagonistic toward people who disagree with them. This can be how we start to see religious conflicts occur throughout the world: It is not just that people disagree with each other, but that they get emotional about it. They start to feel hatred. The emotional areas of the brain are in part of the brain called the limbic system, which is embedded in the more interior parts of the brain. Here is that amygdala, which tends to light up whenever something of motivational importance happens to us. The hippocampus, which is right behind that, helps to regulate our beliefs, but also helps to regulate our emotions and write into our memories the ideas that come about from emotionally salient events. That is why we all remember exactly what was happening to us on September 11, 2001. As we were talking earlier today, the social milieu we are in becomes very important in influencing our beliefs. We are continuously influenced by those around us. This goes all the way back to when we are a child and the influence of our parents helps us form our initial beliefs, which write into our brain at a very early age the beliefs we carry with us throughout our lives. That is why it is difficult to change your religious beliefs. It is difficult to even change your political beliefs as time goes on. If you look at the large population, very few people ultimately do change their beliefs in any very dramatic way because those are written very deeply into our brain at very early ages. But ultimately, as we do grow up, we can be influenced, and we can change those beliefs, and that is part of what we have to look at: exactly how and why this happens. So how do these beliefs form physiologically, and what does this tell us about religious and spiritual ideas, and why religion and spirituality are so ingrained in so many individuals and have been in every culture and every time? There are a couple of statements I like to use. One is that neurons that fire together, wire together. There is physiological support for that, that the more you use a particular pathway of neurons, the more strongly they become connected to each other. We prune back a lot of the neural connections we have as a child, so we ultimately go forward in our lives with a set of parameters through which we look at the world. The other idea about neurons is the old use-it-or-lose-it concept, that when you stop thinking about certain things, when you stop focusing on something, then those connections go away. We all probably took courses in college we remembered a lot of at the time, but if we are not doing it anymore, then we don’t remember it anymore. How do we begin to invoke that? The practices and rituals that exist within both religious and non-religious groups become a strong and powerful way to write these ideas into our brain. The more you focus on a particular idea, whether it is political or religious or athletic, the more that gets written down into your brain and the more that becomes your reality. So that is why when you go to a church or a synagogue or a mosque, and they repeat the same stories, and you celebrate the same holidays that reinforce that, you do the prayers, and you say these things over and over again, those are the neural connections that get stimulated and strengthened. That is a strong part of why religion and spirituality make use of various practices valuable for writing those beliefs strongly into who you are. We have looked at a number of different religious and spiritual practices over the last decade or so. [These] SPECT (Single Photon Emission Computed Tomography) look at blood flow in the brain. We capture a picture of a person’s brain when they are at rest or when they are in some kind of comparison state, and then when they are engaged in the practice, a practice like meditation, for example. This is actually a slice through the brain. You are slicing through the brain, popping the top of the head off, and looking at what areas of the brain are the most active. The red areas are more active than what you see in the yellow, and then ultimately in the purple and the black areas. 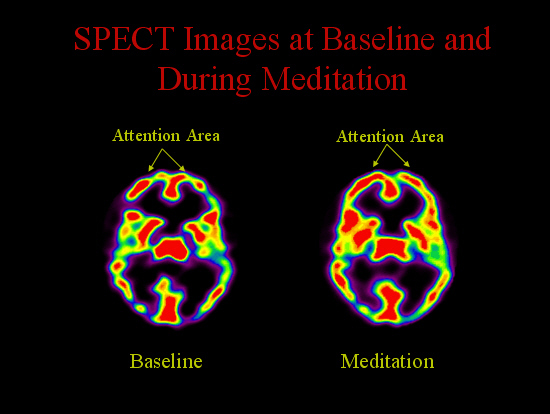 In this part of the brain called the frontal lobes, which I have labeled as an “attention area,” because it helps focus our attention, we see a lot more of this red activity while the person is actively engaged in meditation than when the person is in the baseline state. In the normal waking state, which was the baseline state, there is still a fair amount of activity in the frontal lobes because you have to be ready to attend to whatever is going on around you. But it is activated that much more when the person does this particular practice. I mentioned earlier the parietal lobe, which often functions as the orienting part of the brain. We have argued in some of our hypotheses that when people engage in these practices in a very deep way, they do two things. First, you are focusing on something, usually it is a sacred object or an image or something like that, but, second, you also screen out irrelevant information. As you do this, more and more information that normally goes to the orienting parts of your brain doesn’t go there. So it keeps trying to give you a sense of yourself, an orientation of that self in the world, but it no longer has the information upon which to do that. And if you look at the orientation area, it goes dramatically down in its activity during the meditation practice. It is mostly yellow and just a little bit of red, compared to what you see in the normal waking state. So this area of the brain becomes much less active. We think this is part of what is associated with somebody losing that sense of self. They feel at one with God, at one with their spiritual mantra, whatever it is they are looking at. This was a group of Tibetan Buddhist meditators. We also looked Franciscan nuns in prayer. We saw some interesting similarities and differences. The nuns were doing a prayer called centering prayer, which is kind of meditation. They were focusing on a particular phrase or prayer. It is much more verbally based, I guess, than the meditation of the Tibetans. Again, one of the similarities we saw was a fair amount of increase in this red activity in the frontal lobes. So they activated their frontal lobes as they were focusing on this particular prayer or phrase from the Bible. They also activated the IPL or parietal lobe area. 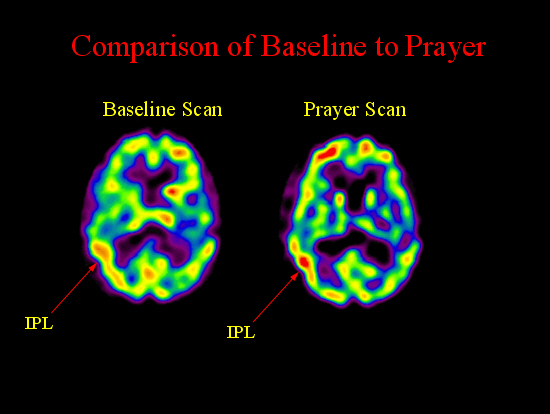 There is a much bigger glob of red in the prayer scan than what you see in the baseline scan. This is part of that verbal conceptual area in the temporal lobes, in the parietal lobes, that helps us think about abstract ideas and language. We didn’t see this in the Buddhist meditators, who had a more visual practice. But we did see a similarity of decreases of activity in this orienting part of the brain; again, it’s all more yellow with just a little bit of red, compared to what we saw in the original baseline state. One of the more recent studies we did, which was very interesting, was a study of Pentecostals speaking in tongues. This was a much more exciting study for me because when you’re looking at people who are meditating or in deep prayer, they’re just sitting there and all the exciting stuff is going on inside, whereas when people are speaking in tongues all the exciting part is on the outside. We had to come up with a different baseline because obviously if I showed you a person’s scan while he or she was simply resting quietly, versus up and about and dancing and singing in tongues, of course you would see all kinds of changes in the brain. So the comparison state here was doing gospel-singing worship. They were up and about, dancing around, singing in English, compared to up and about, dancing around, singing but singing in tongues. One of the most interesting findings we saw in this particular study –these are four slices of the brain while they were singing, so these are just different levels through the brain. The next slide is going to be the same person, now speaking in tongues. 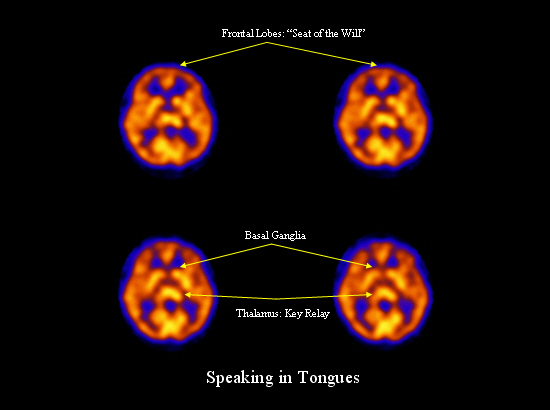 If you look in the frontal lobe area, where the arrows are pointing, as I toggle back and forth, you can see there’s a lot less activity in the frontal lobes when the person is speaking in tongues. So when they started to speak in tongues, and we see this in all the people we studied, their frontal lobe activity goes down. This actually makes a lot of sense because in contrast to the meditators and nuns, who are focusing on doing something, the way the Pentecostals describe speaking in tongues is they are not focusing on doing it; they let it happen. They just let their own will go away and allow this whole thing to take place. They don’t feel like they’re in control of this process. And the findings on the scan at least support the phenomenological experience they have. At this point we don’t have that answer and this is, again, the big epistemological question about how we understand what reality is, how we begin to think about our beliefs about reality and what we can say, ultimately, about what these scans mean in the context of what’s really going on. But I think there’s still some very valuable information in at least understanding what’s going on inside the person who is having this particular experience. So if we’re talking about religion as affecting our brain and our beliefs, we have to acknowledge that it must have some pretty profound effect on our brain if it is going to be something that has such a profound effect on us as people. I have argued in the past that the brain’s role in our overall life is to help us make some sense out of the world, and in so doing, to help maintain us. That’s how it helps us to survive. We have to know not to cross the street when there’s a red light, and what’s okay to eat, and what’s not okay to eat. It helps to make sure we do all the right things in the world. It also helps us transcend ourselves, and by that I don’t necessarily mean a religious transcendence, although that may be the ultimate expression of this, but we always grow and develop over time. There is this continual struggle, if you will, between wanting to maintain the status quo within ourselves and also knowing that we need to adapt and change as we go through our life, and our brain is capable of doing both. It holds onto beliefs very strongly to helps us figure out what we need to do in our world, but it can also change over time. All of us are still the same person we were when we were three years old, but we’ve learned a lot, and we’ve changed a lot over time. As we’ve gone through our lives, our brain has changed with us to adapt and help us survive. Let me pause for a second and ask what we talk about when we’re talking about people who are not religious. There is some evidence to suggest there are differences. Some of you may have read a book called The God Gene. It was an interesting study that showed there was a significant, although relatively mild, correlation between a gene that coded for what’s called the VMAT-2 receptor, which has to do with serotonin and dopamine, two very important neurotransmitters in the brain, and feelings of self-transcendence. The fact that there’s a correlation between the neurotransmitters and some feeling that’s related to spirituality is interesting. Maybe there is something physiologically to this. In our studies, we found — going back to the thalamus that we talked about earlier — that people who were long-term practitioners and meditators tended to have a lot more asymmetry: One side of their thalamus was much more active than the other, compared to the normal population of people who are not long-term meditators. I don’t know what that means per se, but it seems to suggest that the ways in which we process information about the world might be fundamentally different. Read the full transcript and see the full set of slides at pewforum.org.